Welcome back to the Crescent Eye Care blog! When it comes to eye care and health, it’s easy to think that you have your bases covered when you regularly visit the optometrist in Charleston. However, there is more to caring for your eyes. Today, we are going to talk about how to support the health of your eyes by what you eat. For your eyes to remain healthy, you must get a sufficient amount of these five nutrients. Lutein and zeaxanthin may be hard to pronounce, but they aren’t hard to find in those foods that you may already include in your diet. You can find these nutrients in green leafy vegetables (put the iceberg lettuce down!) such as spinach and kale, as well as in eggs. Lutein and zeaxanthin can protect you again chronic eye diseases such as macular degeneration and cataracts. Vitamin C doesn’t just help keep away this season’s nasty cold. Vitamin C also lowers your risk for cataracts, macular degeneration, and visual acuity loss. Simply keep eating several servings of fruits and veggies a day! 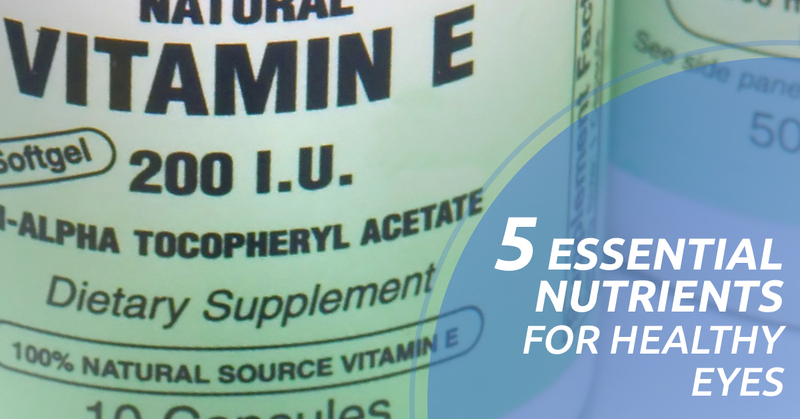 Vitamin E is essential for many of our body’s functions. However, for our eyes, vitamin E can protect our them from damaging free radicals that, as one article states, are known to “break down healthy tissue.” To get the vitamin E that your body needs, be sure to eat nuts, fortified cereals, and sweet potatoes. A supplement can also be helpful to make sure you care getting all that you need. You can find essential fatty acids in many of the foods that we eat on a daily basis. Some of those foods include various types of fish, flax seeds, chia seeds, walnuts, soybeans, eggs, spinach, and brussel sprouts. Essential fatty acids are responsible for visual development and retinal function. Zinc is crucial for your eyes to stay healthy now and into your later years. Zinc is involved in the process of producing melanin which protects our eyes. It is also in highly concentrated amounts in the retina and choroid, and so it’s important that you support your eyes, by replenishing the zinc in your body. As you meal prep and eat throughout the day, be sure to keep your eyes in mind! If you are in need of eye care in Charleston, call Crescent Eye Care!